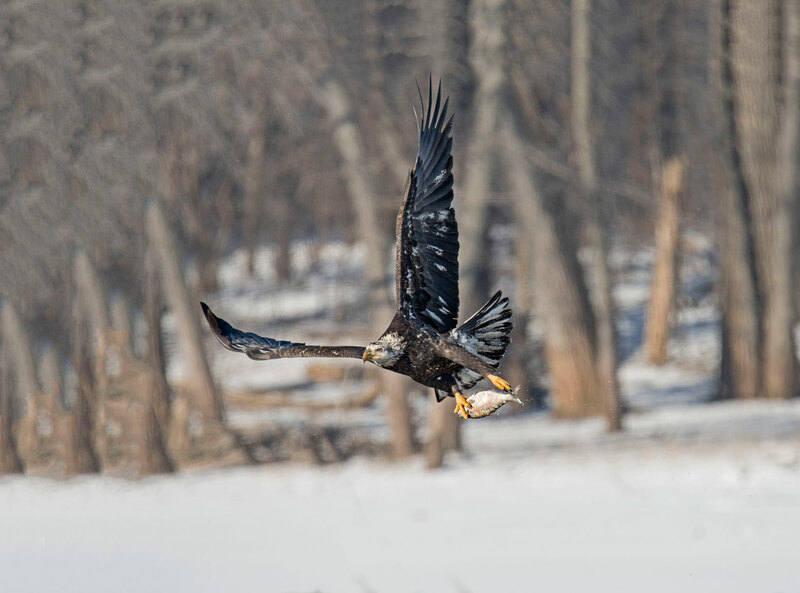 After leaving the Nelson’s on the Rush River we drove down to Red Wing Minnesota looking for Eagles. When we arrived at Colvill Park there were already quite a few eagle watchers and photographers gathered along the shore. It was bitterly cold at -15 but fortunately there was almost no wind. As we pulled into the parking lot we could see over a hundred Eagles sitting in the trees and fishing in the open water. I’ve been to Colvill Park a number of times but have never seen anywhere near this many eagles at one place. 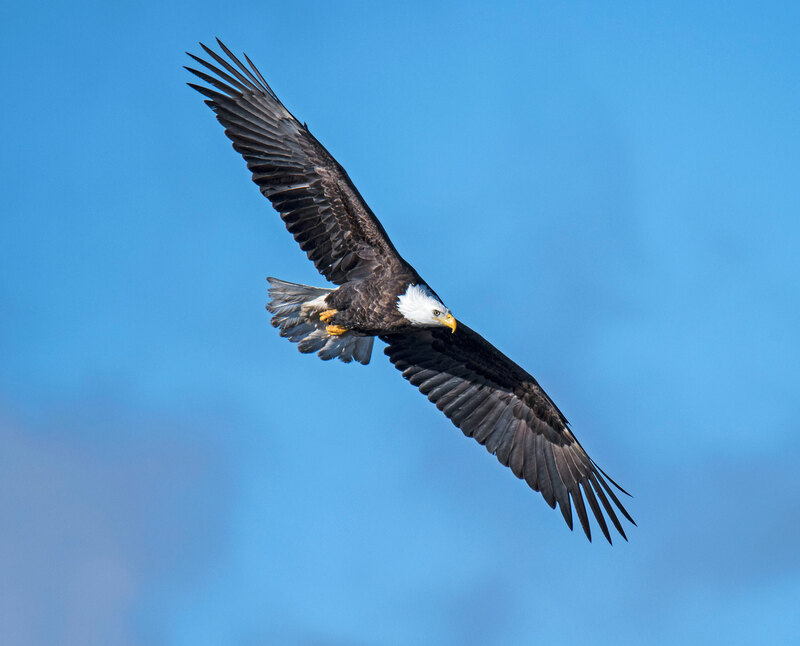 More Bald Eagle photos from Colvill Park can be found on my website. 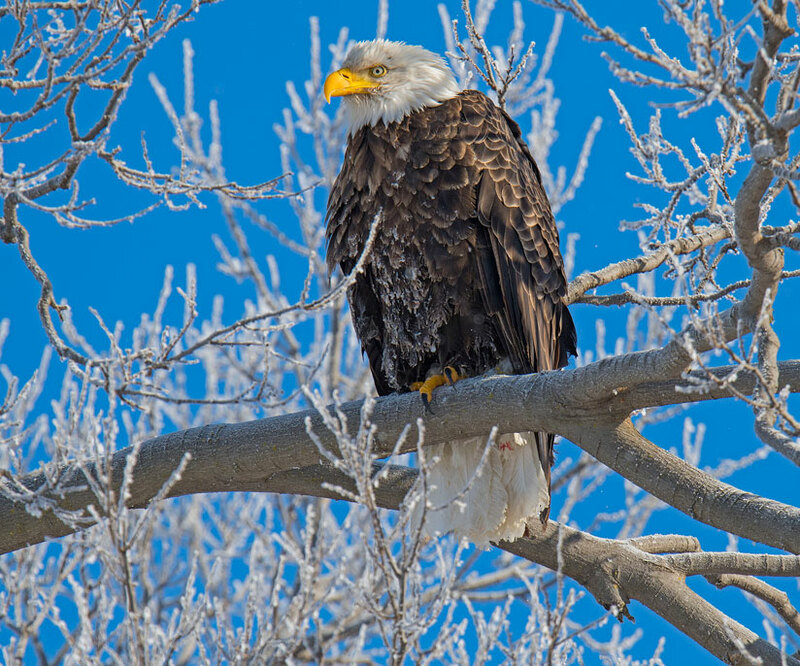 This eagle was sitting in a frost covered tree. He had apparently had success at fishing because his tail was covered in blood. We could see fish along the surface of the water and so could the eagles. They seem to have over a 50 percent success rate on this cold morning. It was really fun watching them fly above the water looking for fish. As we watched this eagle flew up into a tree near the car and was telling everyone that he caught a fish. As winter arrived I started thinking of places and events that I wanted to photograph this winter. The events and bird photography require a little more planning than the Landscape Photography locations. Without a doubt the top of my list is the Apostle Islands Ice caves. I discovered them in 2007 and have photographed them every year they have been open. When I first started photographing them I was frequently the only person on the ice that day. What a difference social media makes. This past winter well over a hundred thousand people visited the caves in-spite of the bitterly cold winter. Given the temperatures we have been seeing so far this winter I would expect the ice caves will open again in February. If you haven’t been you should make the trip. 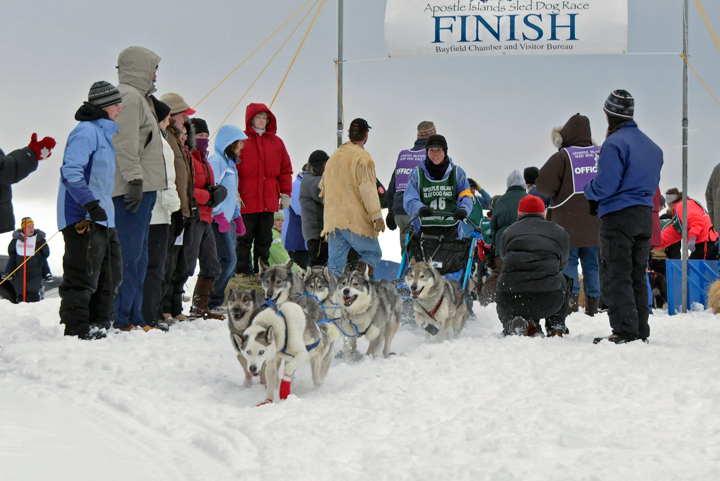 The Apostle Islands Sled Dog Race will be taking place on February 7th and 8th. This is really a fun family event and one of the better sled dog races from a viewers point of view. It is possible to get up close to the dogs at the start of the races. Since it is an out and back race you can also stick around and watch the mushers return. They also have different levels of races from professionals to kids. If you are really lucky, like we were last year, the Apostle Island Ice Caves will be open that weekend. You also may also be able to drive out to Madeline Island on the ice road while you are in the area. Although Bond falls is best known as a fall destination for photographers it provides some exceptional photography in the winter. 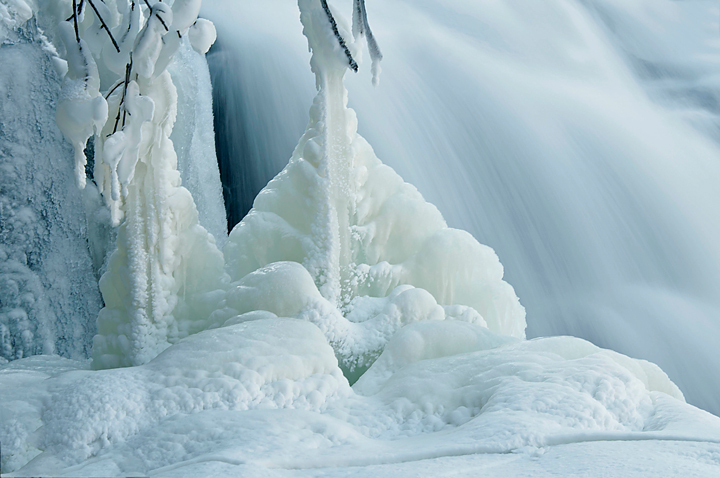 There are not many waterfalls that are all that interesting to photograph in the winter. Bond Falls in the U.P. of Michigan is an exception. Most waterfalls in the Upper-Midwest are frozen in the winter. If there has been fresh snow they look like all of the other scenery. Bond falls is just below a dam it has water flowing all winter regardless of how cold it is. 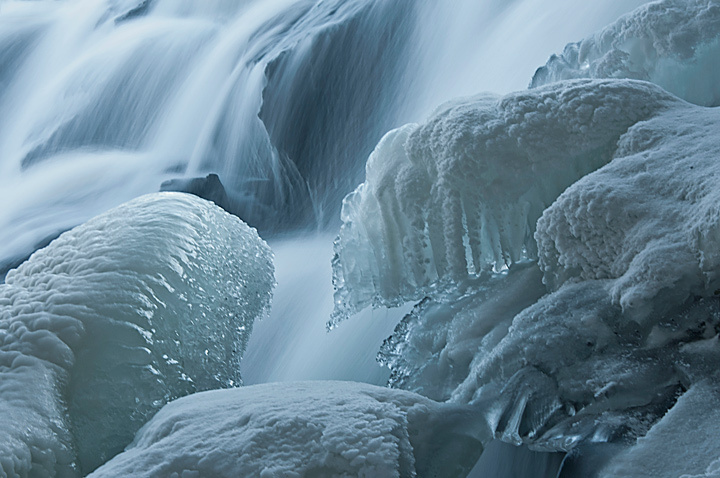 The flowing water combined with some interesting ice formations makes this one of my favorite winter photography locations. 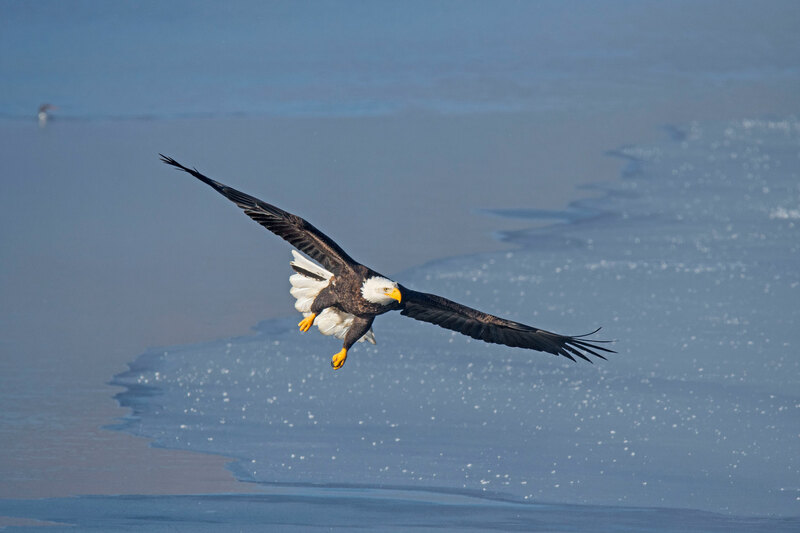 During the winter we make a number of trips over to the Mississippi River looking for eagles. 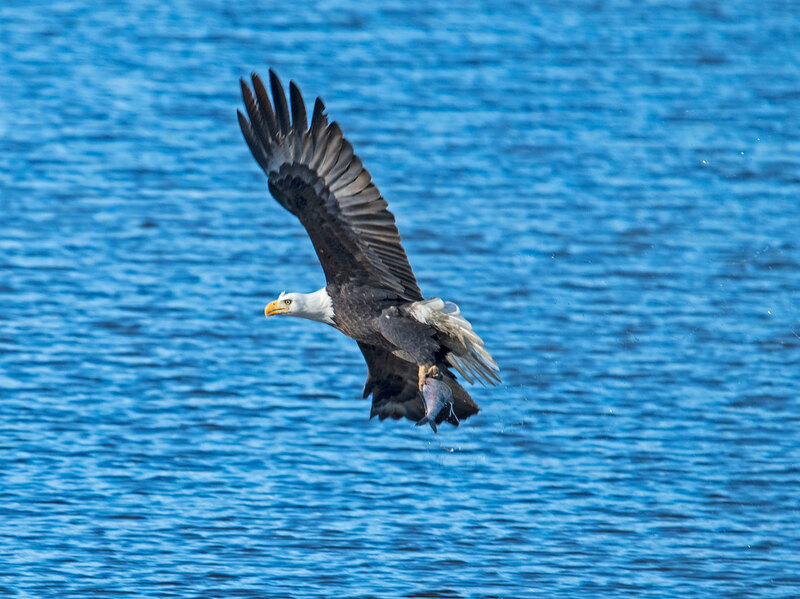 Our first stop is usually Alma, Wisconsin where eagles hang out around the lock and dam. 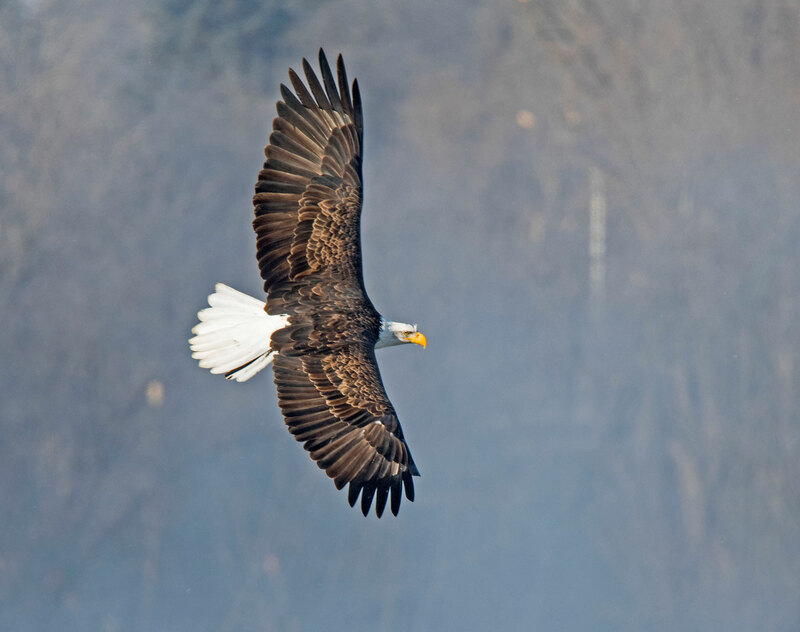 The National Eagle Center provides a weekly report of eagles seen along this section of the Mississippi River. They also provide eagle watching tours. We then drive north to Reads Landing, Minnesota. We commonly see 30+ eagles in front of the Reads Landing Brewing Company. You can stop in the Brewery and watch the eagles in comfort while having lunch. Our last stop is usually in Colvill Park Redwing, Minnesota where the eagles hang out near the open water below the power plant. 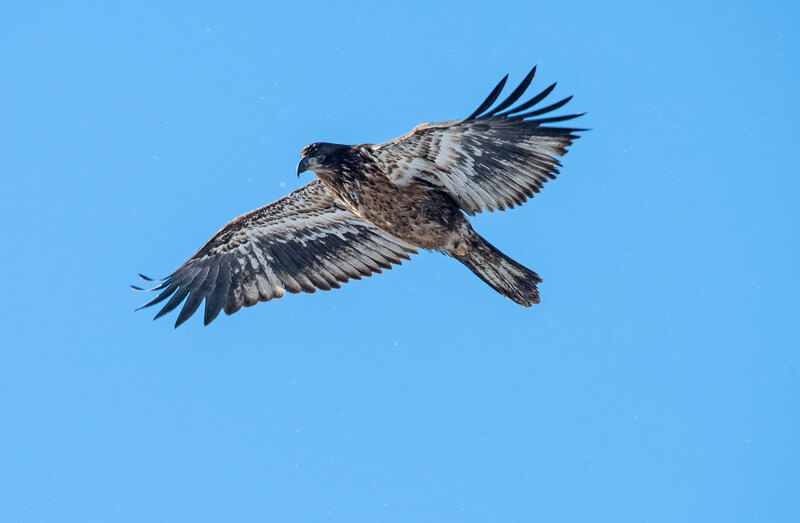 The catch to watching eagles in the winter is the best time to find them gathered in large numbers is when there is a bitterly cold stretch of weather. This causes the Mississippi to freeze up and reduces access to open water. 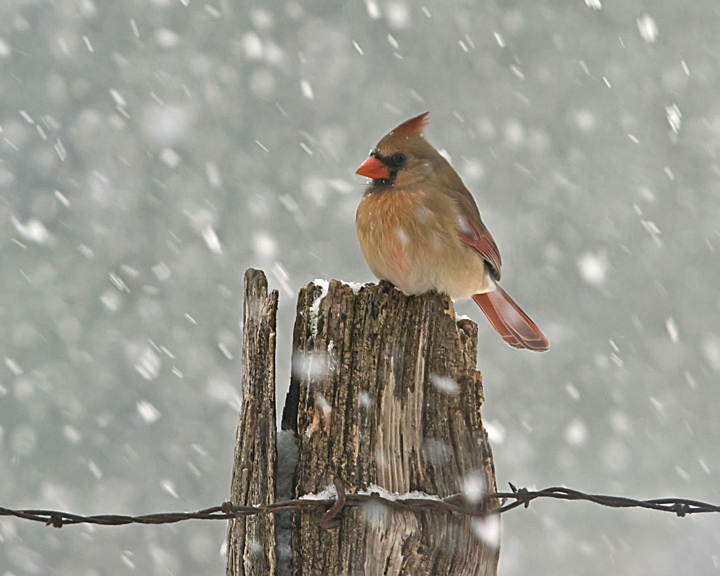 I can usually find something to photograph on the farm during the winter but most of my time is spent photographing birds during snow storms. 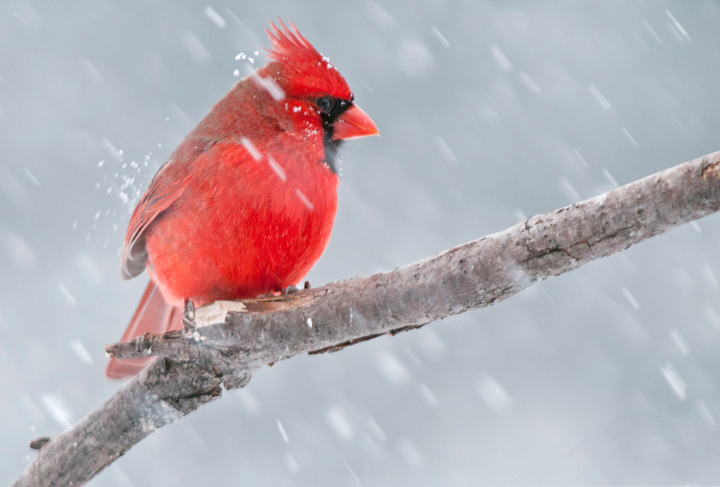 There is nothing like hunkering down in the house with a roaring fire in the fireplace while sitting in my rocking chair and photographing birds. Hudson is a great place to watch Trumpeter Swans during the winter. With the successful reintroduction of Trumpeter Swans into the Midwest watching and photographing them has become a year around event. Trumpeter Swans don’t migrate in the winter they just move to the nearest open water. There is a small patch of open water in Hudson where they congregate in large numbers during the winter months. It is easy to get up close and photograph them. Hudson is also where the Hudson Hot Air Affair is held every February. This is one of the few hot air balloon rallies in the area. It is well worth the trip to watch the inflation and flight of the balloons. 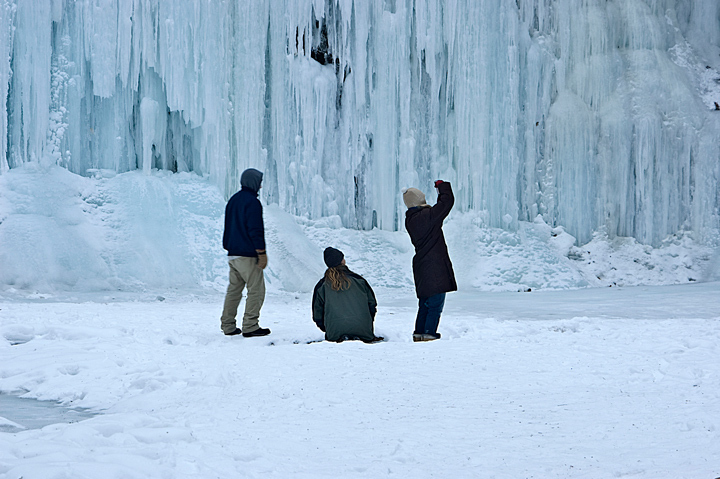 Amnicon Falls State Park is a favorite stopping point during the winter. Although in very cold weather the Amnicon River usually freezes there are times when I can find open water. The tannin tainted water car result in some colorful photos. In the winter most of the Red Cedar State Trail is a cross country ski trail so in order to photograph it you have to be willing to cross country ski. 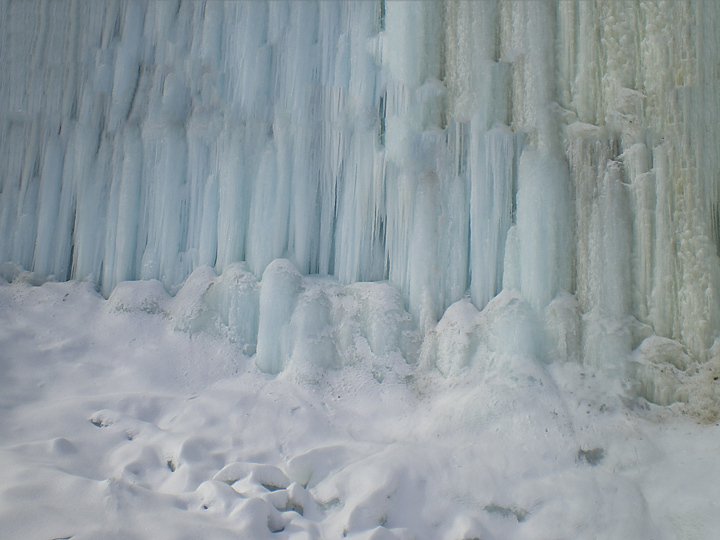 There are some beautiful ice walls along the trail at the 1.5 mile mark. 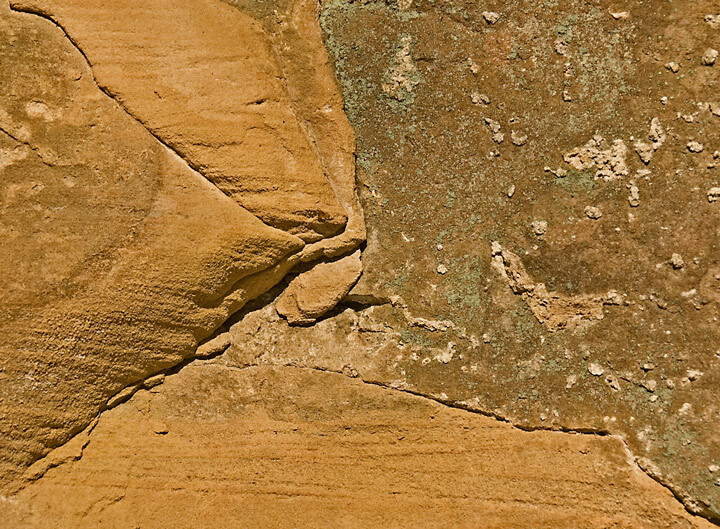 These are the result of water seepage through limestone rock. 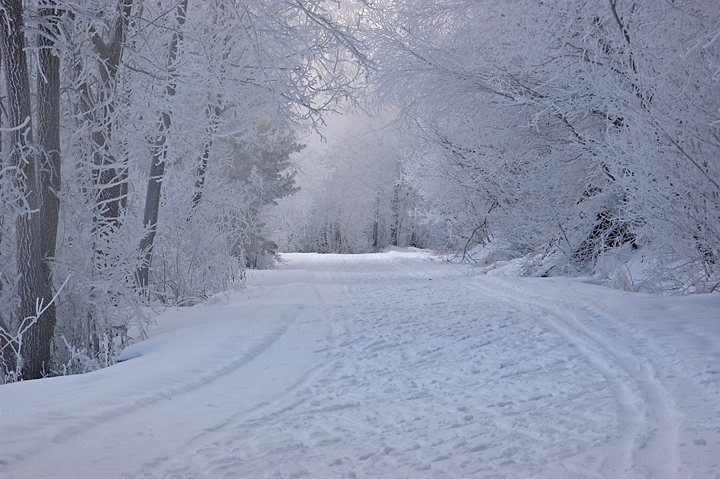 On cold days the trees along the trail can be covered in heavy frost. The southern portion of the trail is a walking trail in the winter and on a sunny day I like to photograph the Dunnville Stone in the late afternoon light. I like to make the trip to Grand Marais at least once every winter. I’m never quite sure what I’ll find. 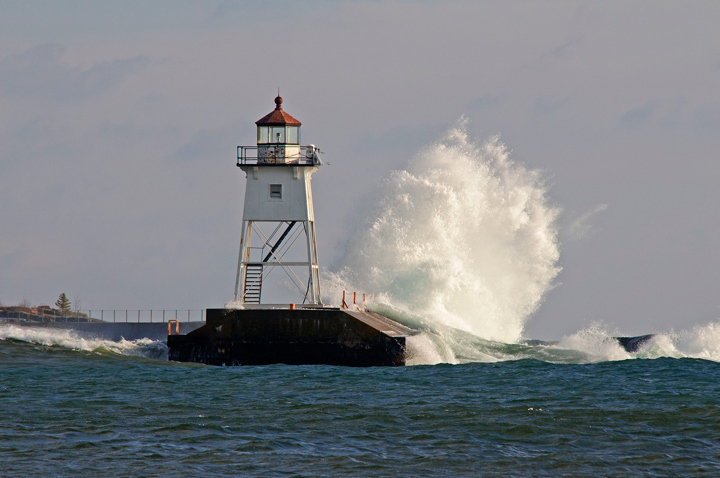 On one trip there were high waves washing over the breakwater and lighthouses. At other times I love to take intimate shots of the ice formations that are formed when the water washes over the breakwater and then freezes into beautiful patterns. 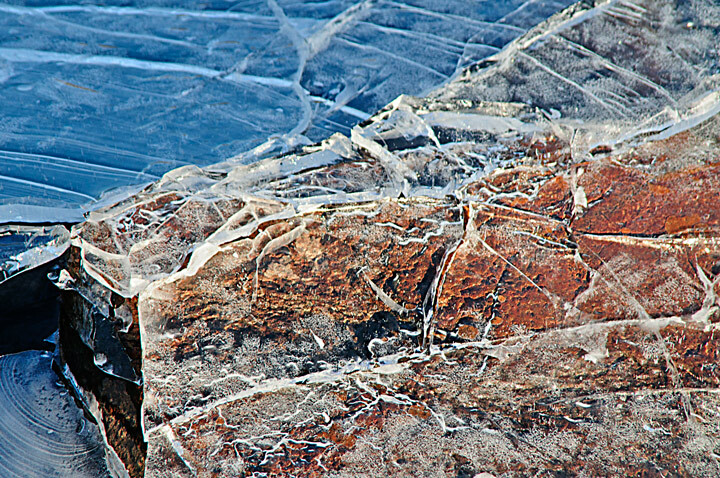 I like to photograph at Devil’s Punchbowl near Menomonie, Wisconsin in the winter. Water seeping through limestone rocks creates a massive ice wall in the bowl. 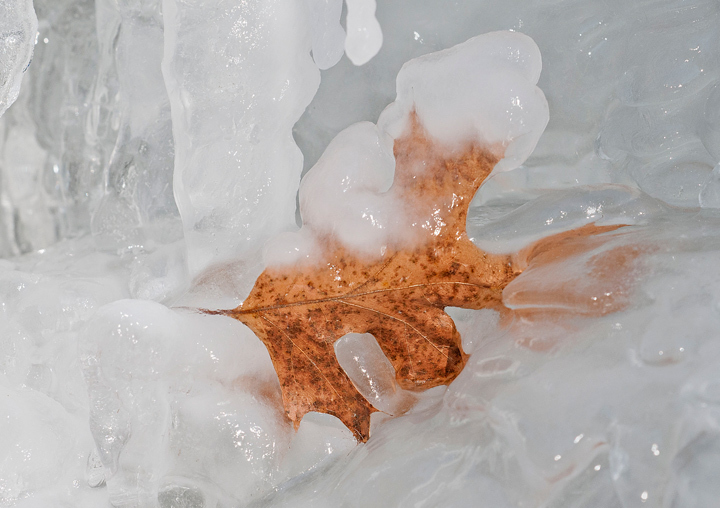 There are also opportunities to photograph objects frozen in the ice. 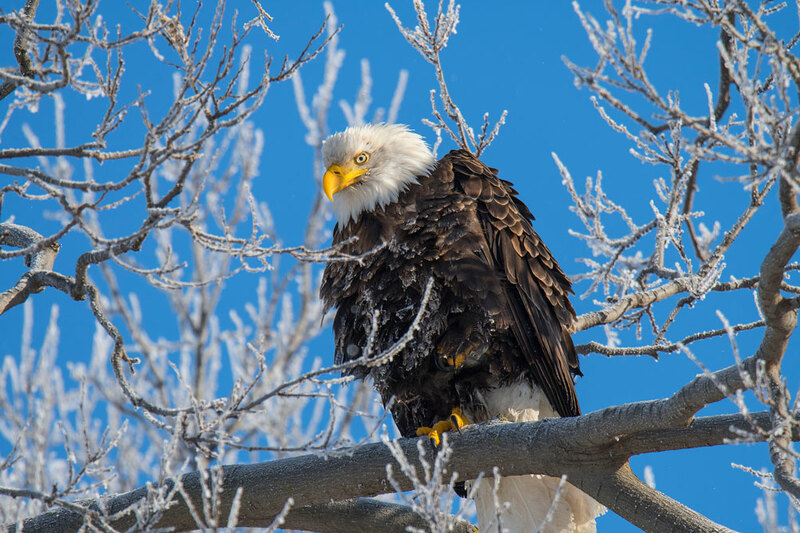 I’ve been over to Colvill Park in Red Wing, Minnesota several times this winter photographing Bald Eagles. I haven’t been disappointed on any of the trips. This first Bald Eagle was sitting in this tree when we arrived. Several other photographers were photographing him and inching ever closer. I thought for sure he would fly before I was able to get my camera out but he didn’t. I photographed him before looking for other eagles. When I next looked he was gone but soon returned. It was a cold windy day and he kept trying to reposition himself so his back was to the wind. He looked a little disheveled. 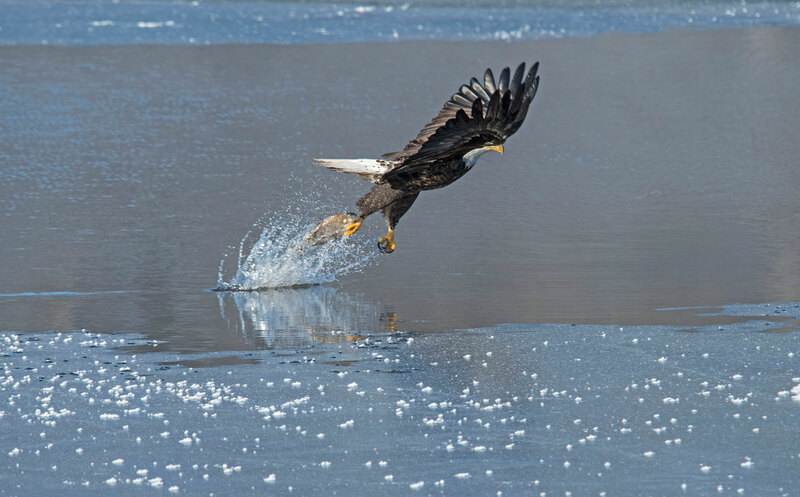 This eagle was busy fishing and I caught him as he was starting his dive. Unfortunately he pulled up short of the water. This fellow was just flying around looking for a meal but not finding anything. 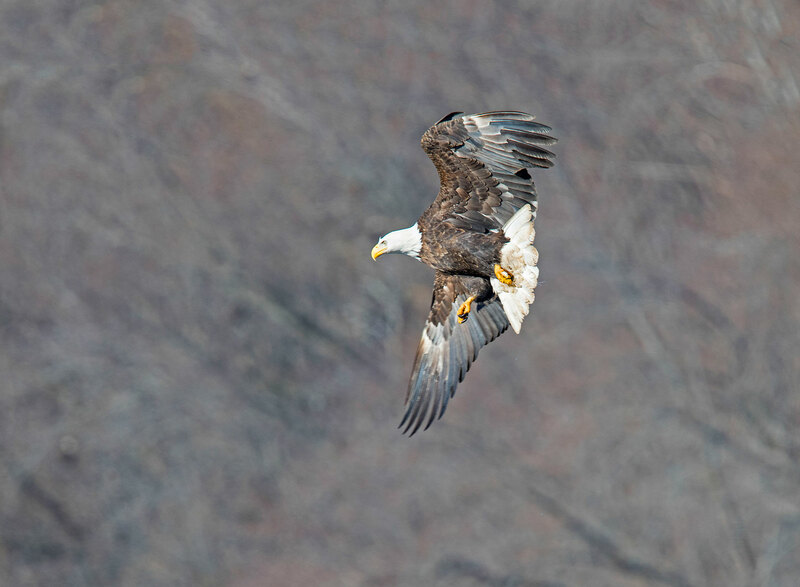 More Bald Eagle Photos from Covill Park can be found on my website. This past week we made our last trip looking for large birds. Our initial visit was to Reads Landing along the Mississippi River. We saw a few Bald Eagles but nothing like what we has seen earlier in the year. As we were arriving one flew up into a tree right in front of the car. Just as I was getting out of the car a long train came by and the bird took off. There were also a family of Trumpeter Swans just off shore. There was a lot more open water than there was two weeks ago. We then headed to Covill Park in Red Wing. 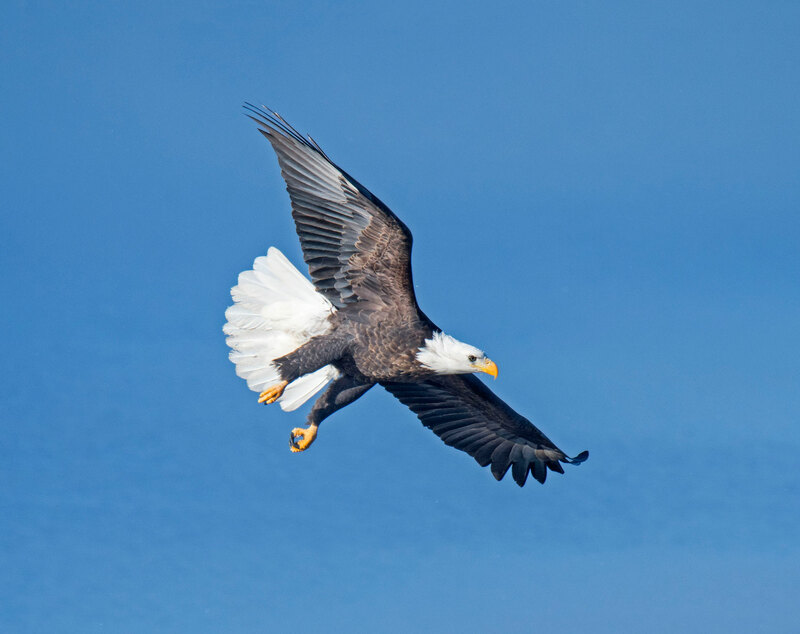 On the way we saw a number of Bald Eagles in the Lake Pepin area. When we arrived at Covill Park the temperature was about 40 degrees warmer than it was on our last trip. There was also a lot more open water. Most of the Eagles remained on the opposite shore. I noticed two mature eagles sitting in a tree and took their picture. The male seemed to be whispering sweet nothings in the females ear. The next thing I knew they were mating. Speaking of mating one pair of eagles in Minnesota has already mated and has started laying eggs. It’s a bit early. This same pair laid their eggs in January last year and the eggs froze and they abandon the nest. They seem to be getting a little closer to getting it right this year. You can follow them on the Minnesota DNR webcam. A few eagles were fishing but when they caught something they attracted a lot of friends. I suppose it is like winning the lottery you find a lot more friends than you knew you had. The bird with the fish usually ended up dropping it resulting in a skirmish on the ground. In between watching the eagles I also watched the many ducks in the area. While I was watching a truck pulled up and all of the ducks started toward shore. Apparently someone comes every day to feed the ducks. There was also a Redheaded Duck hanging around but it was not interested in feeding along shore. After lunch we headed up to Hudson to check on the Trumpeter Swans. There was a lot more open water this time. We could see open water on the other side of the river and the swans seemed to be going back and forth between the two areas. There were also a lot more Canada Geese this time. Until the swans and geese are together you have a hard time appreciating the difference in size. 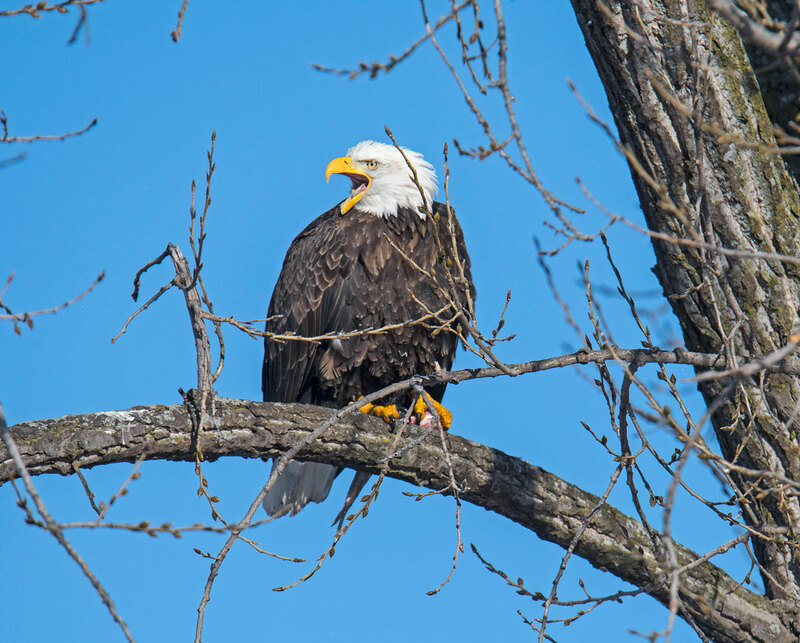 My wife and I headed out last week to search for Bald Eagles along the Mississippi River. Our first stop was Alma below Lock and Dam number four. Not an eagle to be seen. Our next stop was Reads Landing. We saw only two eagles and didn’t bother to get the camera out. We then headed up to Red Wing and Colvill Park. As soon as we pulled into the park we saw an immature Bald Eagle sitting in a tree next to the parking lot. Someone was taking it’s photo. I was able to get some photos of it then went looking for other shots. There were about two dozen eagles in the area. 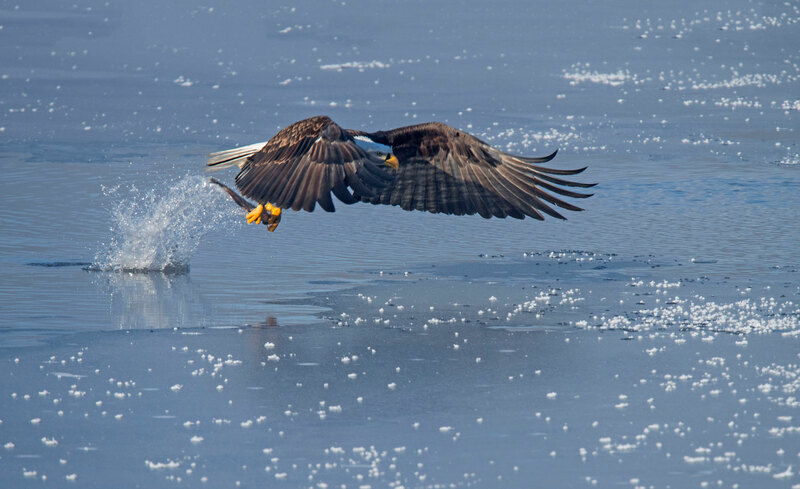 A few of them were successful in catching fish but as soon as they landed they attracted other eagles that started battling for the fish. In several cases they lost the fish. The immature Bald Eagle returned to a tree near the parking lot so I managed some more photos of it. In talking with another photographer she said that earlier in the morning it had landed on one of the docks and she was able to walk up to within four feet of it. Most of my photos were of immature Bald Eagles because those were the ones hanging around the parking area on this particular day. They should be around until the end of February when they will disperse to their summer grounds. 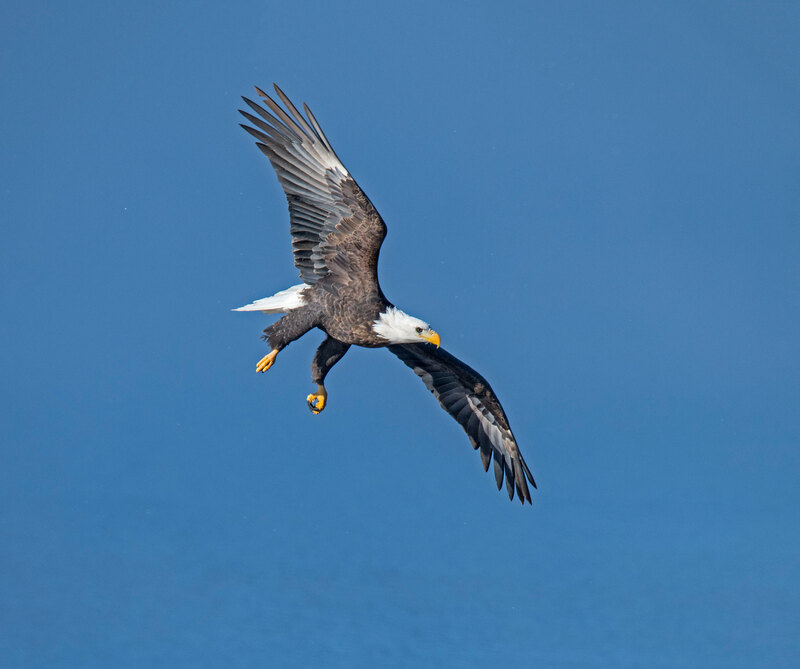 More Bald Eagle photos can be found on my website.